“We’ll fight in the shade,” came the rather curt reply which was dripping with sarcasm in the movie “300”. Well, the Spartans were a well oiled fighting machine that took no prisoners, and did not know the meaning of fear. Having said that, you might not have the kind of guts shown by King Leonidas and his brave 300, but at least you can pay homage to the man with the Spartan Knife Block. 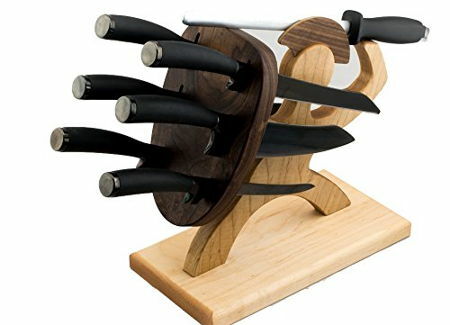 This is one unique knife block that will help you relive the glory days of yore while you are in the kitchen trying to whip up the next delicious meal, as it carries every of your knives in an elegant manner,while showing the heroic Spartan behind his shield being completely safe. Definitely a conversation starter by any means, and it is made out of maple and walnut.